The Aura Purity diffuser is compact and stylish with its natural looking faux wood grain base and warm white light. Ultrasonic diffuser works by breaking down the 100% essential oil into micro molecules then projecting them into the air to fill a room or work space. The essential oils which are diffused and become airborne in tiny particles are not only pleasant on the nose but contribute to overall health and wellness. 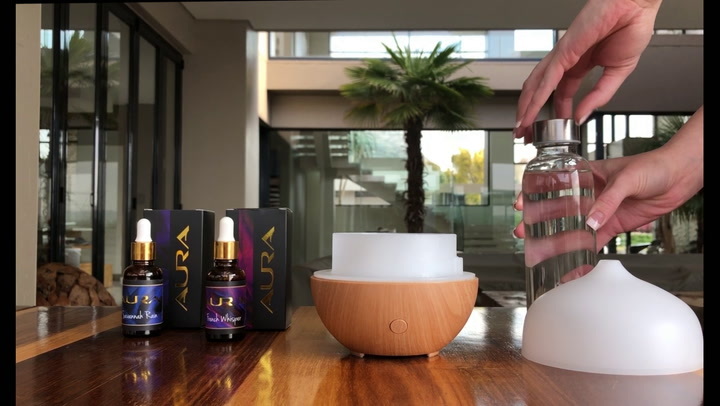 We are SO very happy with our aura diffuser, it is well made, good quality and it “diffused” for about 5,5hrs! It’s gorgeous!! I love my Scent Works Diffuser! It looks lovely in my home. I enjoy trying out different essential oils, like Lavender at night and Sandalwood in the day. It gives off a nice glow and is quite silent. Would really recommend this product. I really like this little guy. The light is a little brighter than I thought it would be but it's a lovely warm light. You can see the shadow of the wires inside the product when the light is on, and it's not the most pleasant to look at, but if you don't mind that then it's perfect. Comes with a little essential oil too which was a great surprise.